You have to be creative! So be sure to think outside the box! Spring and Fall are my two favorite seasons. The transitional seasons, signs that newness is approaching. I can always appreciate newness. It's time! Time to dust off those blazers, light jackets and wind breakers if you see fit! I smell FALL! 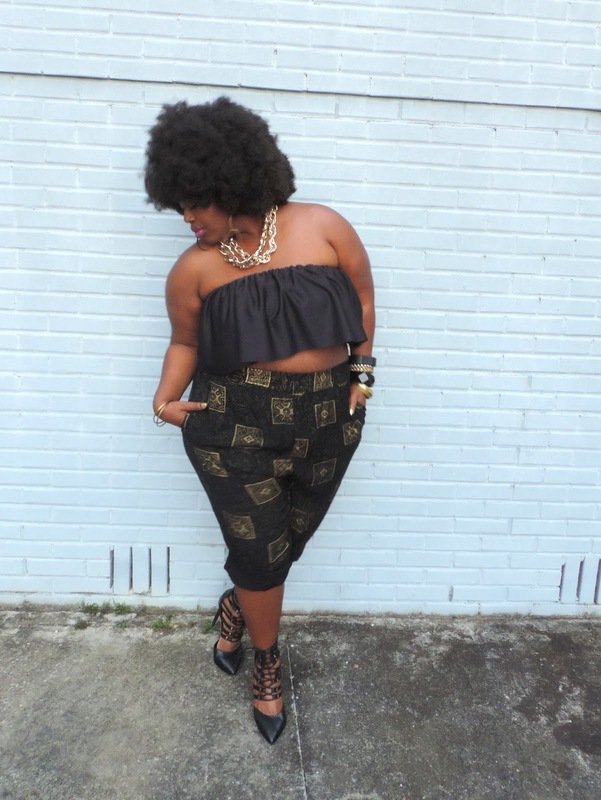 Currently Trending: African print, crop tops, and denim. My thrifting budget has been cut in half in an effort to live below my means, it's not that bad because my creativity is on level 57 and I'm re-styling a lot of classic pieces from my closet. I've had these thrifted pants for a few years now, and this is how I decided to wear them today. Denim Jacket is from the Mens' section at the thrift store as well, doused in bleach of course! I made the top out of some scrap fabric laying around and the shoes are probably the most comfortable pair I own. They're from Shoe Show. I'm ITCHING for a new hair do! I have a talented friend who makes wigs! This fro is one of hers Pretty Protective Styles By V! It's big and commands attention! !